Exactly a year ago tomorrow one of my favorite MMORPGs closed its doors forever. My affection for the game is well-documented. No fewer than four dozen posts here hold the tag "City of Steam". I played the game in all of its iterations: from Sneak Peak through alphas and betas, at launch and on to its first seeming demise before its unlikely rebirth; then, finally, down into a future of drifting decline. The posts tell a tale of frustration and disappointment as much as one of joy and delight. All emotions, I'm sure, that must have been shared by its various creators and owners along the way. When the engine powered down for the final time I did something I've never done before. I bought the soundtrack. City of Steam had a magnificent audioscape, of which the score was just a part, but it was the only part on offer so that's what I got. I've listened to it often, too. That probably should have been the end of it but there's a coda. Mechanist Games, the ill-fated company that had such high hopes at the start, only to see them thwarted, altered and watered down until what was left must scarcely have seemed recognizeable even to those who helped bring it to the world, didn't fold up their development tent and slink away into the night. They opted instead to work on a smaller canvas, taking their vision mobile. The second game to emerge under their banner is not an MMO, sadly. The days when those letters suggested a license to print money (a license that few were ever required to produce) ended some time ago. The captioning in cut scenes could use a little work. 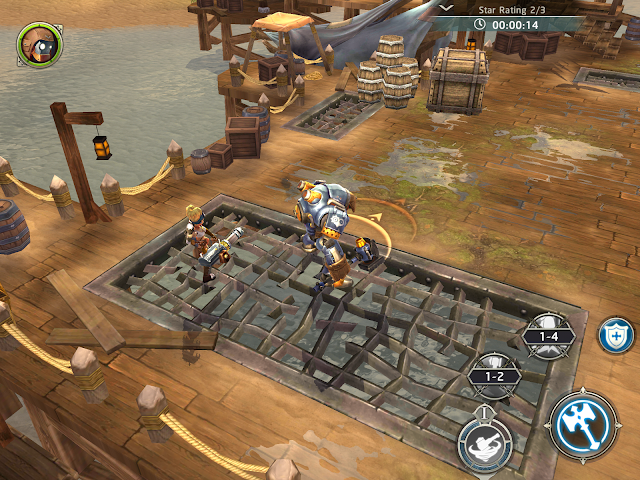 Heroes of Skyrealm is described as "a 3D mobile action RPG" for iOS and Android. I've been keeping an eye on it and today I finally got to try it out. An observant reader of this blog might notice that The United Kingdom, the country from which I am writing, doesn't appear on that last list. If it did I would probably have been posting this back in October. I have the website bookmarked and I check it fairly regularly. A couple of days ago I was doing just that when I noticed that the U.K. had been unceremoniously slipped onto the end of the line-up. The FAQ hasn't been updated and it was sheer chance I spotted it on a link from YouTube. Today I downloaded the game from the Google Play store, where it has a confidence-inspiring four-star rating. It installed smoothly although the over-zealous virus checker I'm using for Android (AVG - going to swap it for something else as soon as I can be bothered) tried to tell me it was Malware simply because it uses in-app purchases. This shot was taken in a thunderstorm. The lightning effects and rain were highly atmospheric but unfortunately they haven't reproduced well. I then ran through the first few chapters of the tutorial, which played beautifully and looked even better. Taking screenshots on my tablet is a hit-and-miss affair so I didn't get the ones I wanted. Still, I think it's clear from the couple of action shots I did manage to take that all the first-rate design aesthetics from City of Steam have transferred seamlessly to Mechanist Games' new baby. It's also the exact opposite of Revelation Online in that Heroes of Skyrealm looks better in-game than in screenshots. It also sounds fantastic, which isn't surprising when you learn that the score is by the same person who did the score for City of Steam - Daniel Sadowski. Gameplay-wise I haven't played enough to form much of an opinion. Like just about every mobile RPG I've tried (which isn't a huge number - maybe nine or ten so far) it lacks subtlety. I'm really not the target audience for mobile games of any description, though. If I'm out of the house I'd pretty much always rather read a book or listen to my iPod than play a game, assuming I'm not just people-watching or sight-seeing anyway. The one thing I would immediately flag up as an issue is the translation. It seems to suffer from exactly the same problems in this respect as City of Steam. The sentences rarely have any rhythm and the dialog feels off somehow. It's not that there are glaring grammatical errors or walls of sheer gibberish, more that everyone talks like someone who has good English but only as a second or third language. Blame my screenshotting skills (or lack of them) for the unfinished sentence. I clicked while he was still talking. 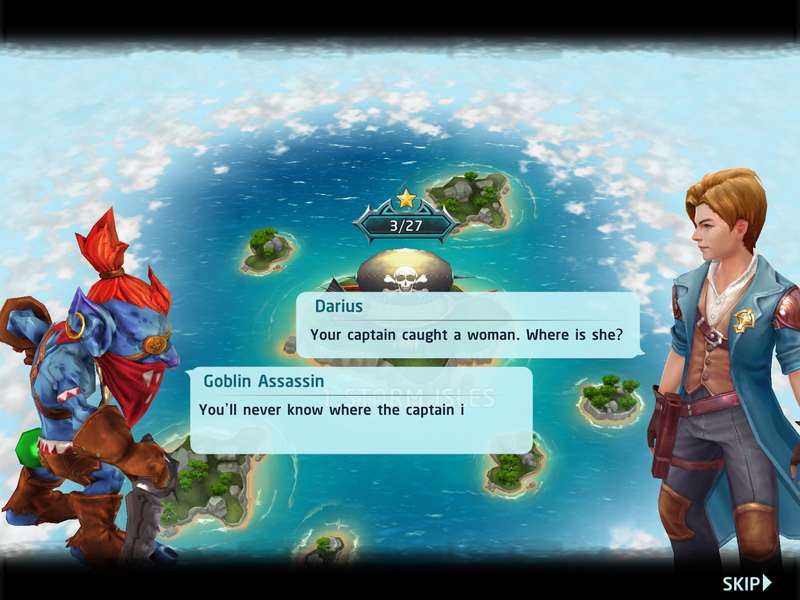 I actually wanted to get a much odder conversation about how a female pirate was "more masculine" than the men but I missed that one completely. This is odd because the original creators of Mechanist games were English and the first iterations of City of Steam were idiomatically and indeed mellifluously written. Somewhere along the line the task of writing the words must have been handed on. I wish whoever was doing it back when the company was much smaller would take that task back. Apart from that Heroes of Skyrealm looks like it should be a jolly good wheeze. I hope it does really well, not only because Mechanist Games deserve a hit, but also because if the studio prospers then the prospect of seeing more of the world in which City of Steam was set might come a step or two closer. Indeed, the demise of that world may not be quite as "forever" as I suggested at the top of the post. The website is still up, defiantly affirming "City of Steam: Resting, Not Retiring". 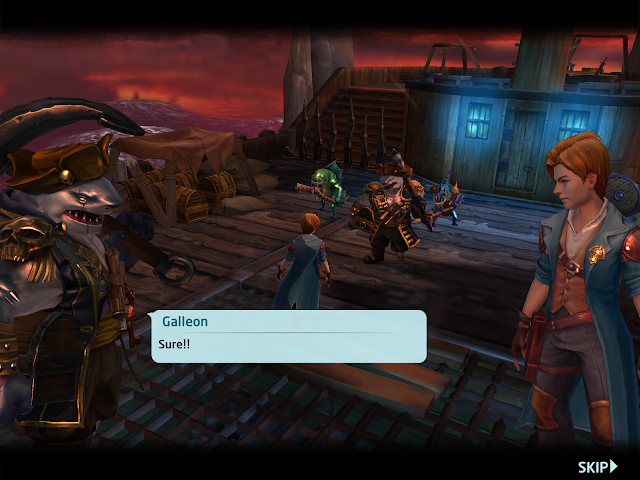 What's more, it seems that Heroes of Skyrealm not only "draws inspiration" from the world of Nexus, it's set in the same world. At the very start of the game I was offered a choice of three Heroes: Reinhard, Kashiko and...Servo "an outdated wartoiler [who] fled the Nexan Republic...". In a strange way it felt almost like coming home. Revelation Online continues to mystify and amuse in equal measure. Yesterday I set out once again with the intention of stepping off the moving walkway that passes for questing in this strange game. Having failed to discover how to begin crafting or harvesting and with nothing related to housing anywhere in sight I thought I'd just wander around and take in the sights. In some ways RO could be an explorer's dream - if you equate exploration with tourism, which I confess I often do. As far as I can tell you can click on just about any icon on the main map - a vendor, for example - and the game will autorun you there. Doesn't matter if you're on the coast and the target is in the high mountains half a continent away. Doesn't matter if there are rivers or seas between you and your goal. It certainly doesn't matter if you've never been there before and have not the slightest idea how to get there. At first I had to run but now the game responds to my imperious clicking by having my character produce a blast on a whistle to summon her horse. She then mounts up without any help from me and off she rides. If they come to a body of water the horse vanishes and my character swims like a fish. Quite literally like a fish, in fact, or a mermaid. All movement from the waist, legs going side to side like a tail, no arm movement at all. Unlike, say, GW2, your character can't automatically breathe underwater but it takes a very long time indeed for her breath to run out. I've done several quests requiring diving that would have drowned someone in EQ2 and I've yet to see her breath bar go under 90%. Airships look a lot more impressive from the ground. While riding it seems mobs ignore you completely. I've watched as my Spirit Shaper, sitting serenely, sidesaddle, on her Red Horse, canters through herds of aggressive beasts ten or twenty levels higher than her own. They might as well be rabbits. I had plenty of time to consider all of this at the start of the first session because I'd idly clicked on one of the many (MANY!) hourly, daily and weekly Events that the game thrusts into your hand the moment you log on. Something about eggs. I was hoping it might be like the egg smashing event I used to love doing in City of Steam or the Joker's Funhouse in DCUO. Maybe it is and maybe it isn't. I wouldn't know because the place it begins turned out to be a hundred miles to the West. I'd been riding for what seemed like hours but was probably about five minutes, which is still a significant amount of time to be auto-riding a horse in a game, when I got distracted by a city. Revelation Online is one of those games that seems to think the average NPC is about 75 feet tall. Everything is on a truly gigantic scale. I mean, I've been in some big buildings but you could put a whole cathedral in the atriums of some of these halls and still have room for a train station and couple of grain silos. It makes the cities somewhat impersonal, I think. 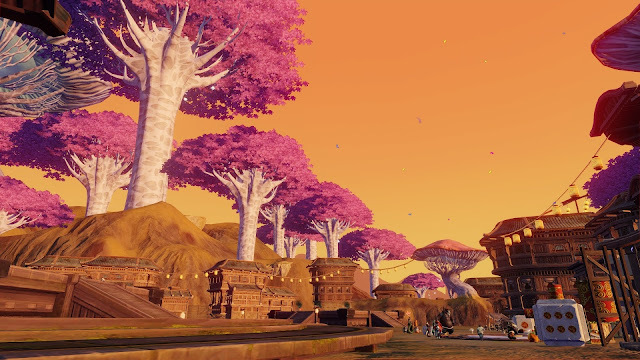 Divinity's Reach in GW2 is big, yes, but it's also rich in detail and made up of many small courts and alleys. Here the smallest thoroughfare is an avenue and every square's a parade-ground. I was lollygagging at the mountains from a high terrace when an airship the size of a small town pulled up alongside me. 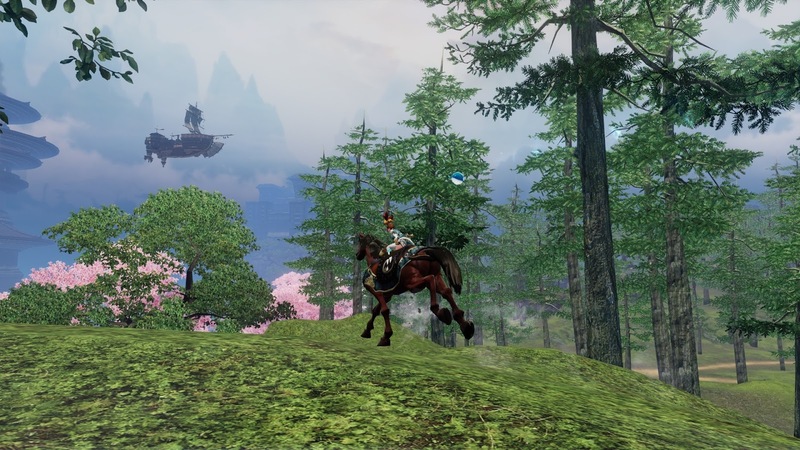 In seventeen years of MMO gaming I've never knowingly turned down a free voyage on any kind of ship - sea, air or space - so I rode my horse onto the deck and off we went. Again, the scale was so massive that all sense of "being there" was lost. Unlike the ride in the tiny hot air balloon in 9Lives, for example, which had me tensing my knuckles with vertigo as I craned over the edge for a good view of the rooftops, this had all the thrills of a cross-channel ferry. On an airship. In case you couldn't tell. 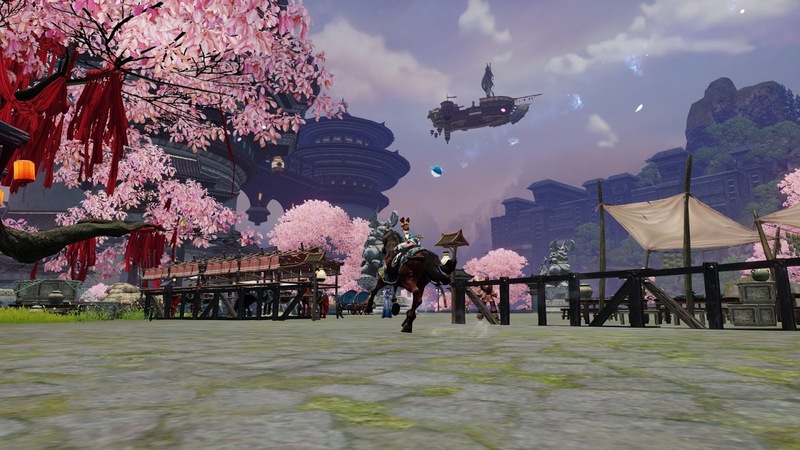 One thing stands out concerning travel in Revelation Online, whether by foot, by horse, by water, by air or via the widespread network of teleport pads: it's free. When GW2 launched and for months afterwards there were grumbling complaints about the few silver it cost to use the waypoint system. In EverQuest, EQ2 and Rift when they were new I vividly recall how I had to scrimp and save to buy even a basic mount. Getting a good ride has been positively aspirational in most MMOs I've played. In RO they hand them out for doing, well, nothing. Nothing that you notice. I got a choice of horses at the end of one of the never-ending, incomprehensible quest sequences but later I found the same horses for sale on a vendor for a pittance. Like Aion (and Flyff long, long before that - anyone remember Flyff? Anyone? Bueller?) RO is supposed to be a flying game. There was that part early on that I mentioned in my First Impressions post, where someone lends you his wings so you can see for yourself what you're working towards. You'd imagine there'd be some kind of ceremony, fireworks perhaps or a fanfare at least, when you acquire a permanent set of wings all your own. Apparently not. I knew wings came at Level 29. I was level 27 when I jumped back on the quest train (Don't judge me!). I thought I was paying attention but a quarter of an hour later, when I clicked autorun for the millionth time, for once taking a quest step that needed me to travel further than the usual four or five paces, I suddenly found myself enveloped in a cloud of feathers and hurtled skyward. Checking my details as I barrel-rolled through the ubiquitous cherry-blossomed skies I saw that yes, I had indeed dinged 29 without noticing. I was, in fact, almost 30. 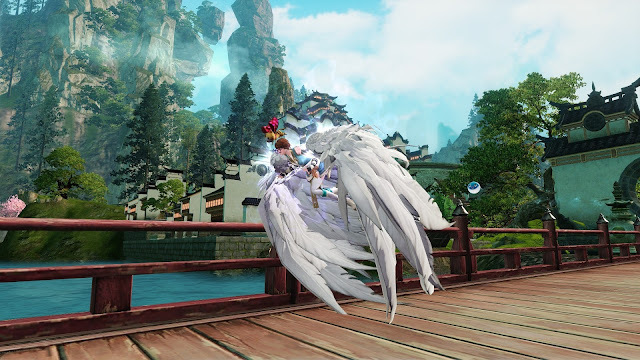 The game, recognizing my graduation from hooves to feathers, now auto-equips my wings instead of my mount whenever I want to travel. I may be being a tad unfair here. It's entirely possible I got the wings as a quest reward and just clicked through in a daze. I long ago lost any feeling of involvement or control or interest in the questline, whose translation is now so fractured as to be almost Dadaist and whose plot I ceased to follow somewhere in the mid-teens. Even if I wasn't paying attention, though, I think it's safe to say the game does not make all that much of a fuss about this supposedly seminal moment. It's a shame because the wings themselves are very impressive. 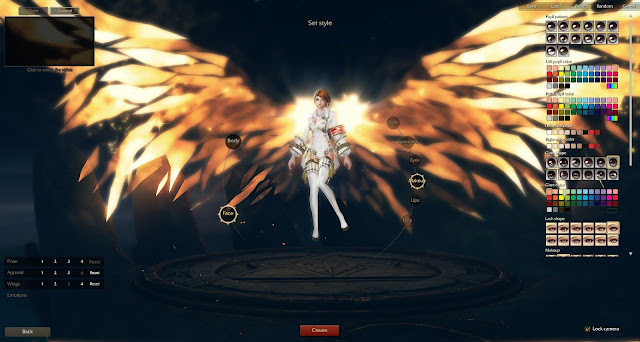 If this is the basic starter model I can't even imagine what Raid wings might look like. Closed Beta 3 ends in a few days. I am not sure whether I'm glad about that or not. 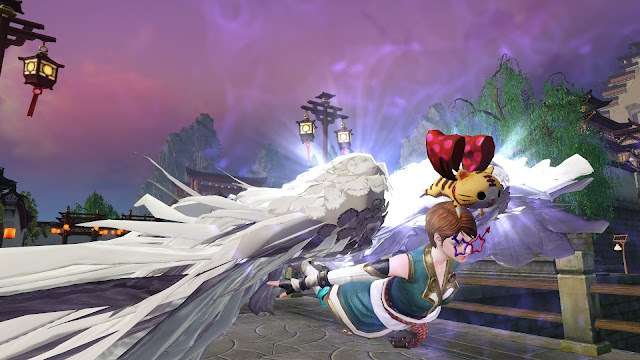 I find Revelation Online extremely difficult to take seriously but it isn't boring. Or sensible. I do think, every time I play, that if I'm going to play something like this I might as well get my semi-established characters out in Blade & Soul or ArcheAge or Black Desert or even Riders of Icarus, all of which I was enjoying well enough until I dropped them cold. 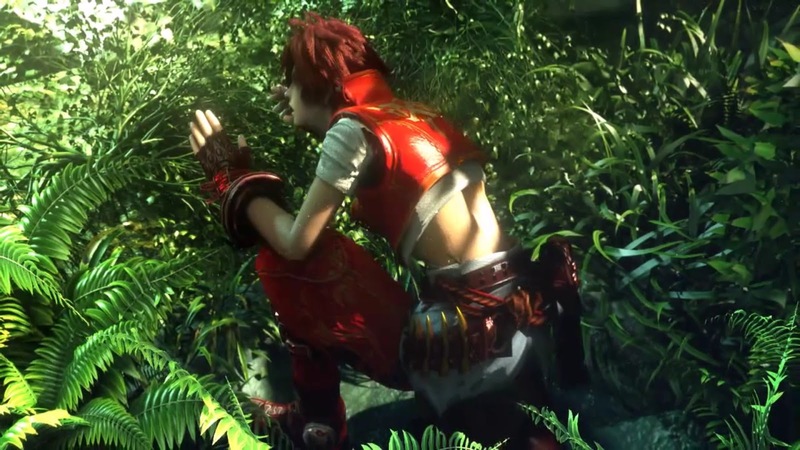 Truth is, I really like trying new MMOs, even when they aren't very "good". I may spend 90% of my time in old favorites but I crave novelty as much as anyone and trying out crazed imports like these (or Digimon Hunter or Twin Saga) is a great way to get that novelty buzz. A couple of days ago, Wilhelm posted what seemed to me to be a very provocative piece of agitprop, in which he asked - nay, demanded - "Where the Hell is that EverQuest Successor Already?". The post itself may or may not have been layered in irony but it and the comments it generated positively dripped with hooks. Since I generally need no encouragement whatsoever to ramble on about EQ (the problem usually being how to stop me) I could very well have found myself continuing the discussion here today. As it happens, though, this post is at a tangent to the main argument. It's more a thank-you to Wilhelm and his commenteers for nudging me, at last, to do something I've wanted to do for years. Something I've started to do several times only to lose my nerve and back away. Something that, if it hadn't been for Wilhelm's post and the comment it received from someone called "Great Sword", I might never have gotten around to doing. Interesting to see news regarding EQ. I recently discovered something very relevant to this post — Project 2002. They are similar to P99 and host their files in an easy download ( all files no searching), right to the PoP expansion. It’s a wonderful server, a lot like returning to EQ after you left back in 2004…There is a strict no 3rd party software and a manual 3 box limit with a focus on grouping. I had very vaguely heard of P2002 somewhere, somewhen, but for whatever reason I'd never investigated further. I am, of course, hugely more familiar with P99, the quasi-legal archival enterprise, sanctioned by John Smedley before his fall from power. As Wilhelm points out, though, even with the legal issues pushed into the background, P99 requires a retail box purchase of the EQ Titanium compilation, currently retailing for $140 and up on Amazon. That presents a very high bar. 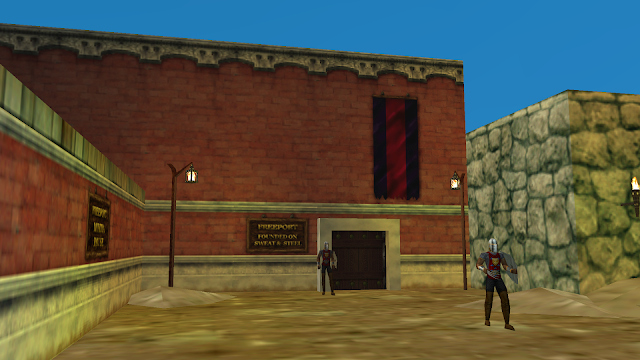 Also, I am not particularly keen to revisit the original, 1999, version of EverQuest. I played it and I loved it at the time but I'm one of the least bitter of veterans. To my eyes, EQ has improved continually and markedly throughout its lengthy lifespan. Even if I could go home I'm not sure I'd want to. If I did have an EQ time machine I don't think I'd set it for 1999 anyway. We all have our favorite periods or time-spans within the MMOs we favor but I look back with enormous fondness on several epochs of EQ. Early Velious was magical and I absolutely adored the Luclin era. 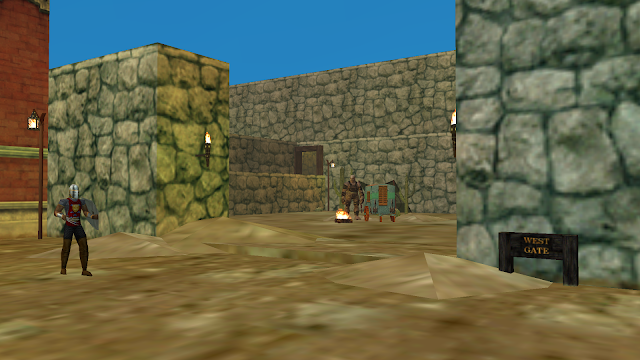 The reign of Lost Dungeons of Norrath was one of the most intense and involving six months I ever spent in any MMO. I could even make a case on behalf of Depths of Darkhollow, The Serpent's Spine or Secrets of Faydwer. Truth is, I love EQ in all its forms and faces. I don't feel a sense of loss or betrayal when I look at what the game has become - just a deep satisfaction that I've been lucky enough to be there all along to see it change. 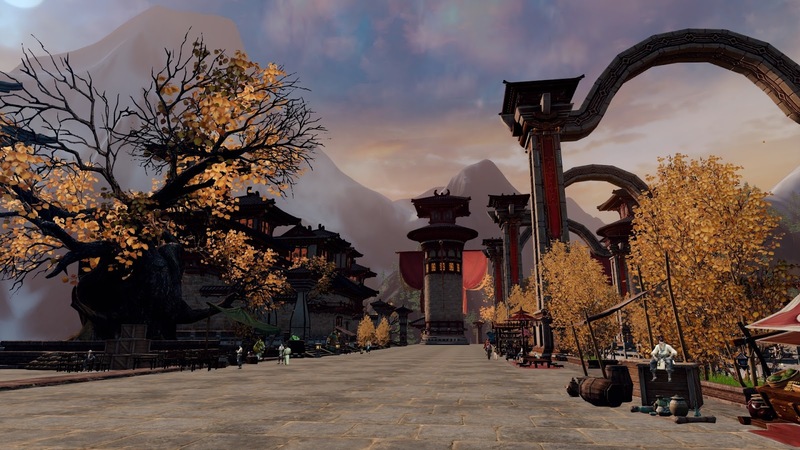 What SOE did to Freeport, one of the most emblematic of all MMO cities, was a crime. Specifically, it was vandalism. They tore down a work of art and a piece of history and replaced it with an ugly, confusing mess. Everyone hated it. Everyone avoided it. Now everyone ignores it. One big difference - I can read the signs. In 2002 on a 14" CRT monitor this was just a blur. 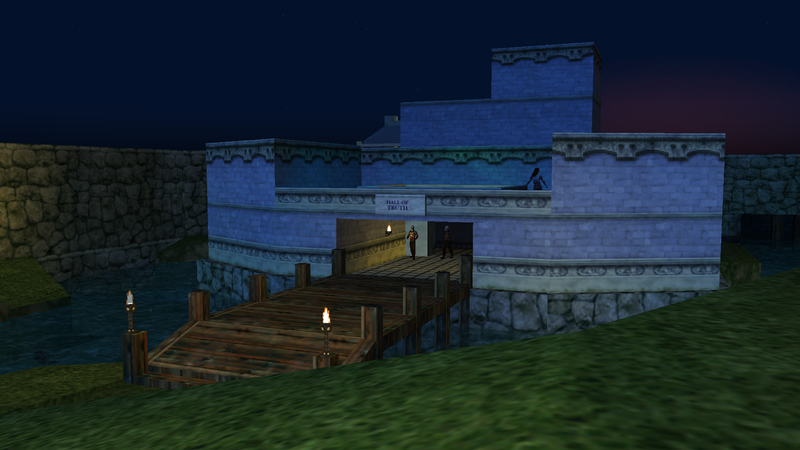 So, I'd long had it in mind to visit Project 1999 purely to see Freeport again. The real Freeport. I looked into the possibilities a few times but the cost of that genuine copy of Titanium was always too high and the alternatives looked too shady. And other than seeing Freeport not much appealed. 1999 was setting the dial just that bit too far back. I googled it. It did indeed appear to be just as easy and straightforward as Great Sword claimed. This morning I made an account, downloaded and installed the files and guess what? It was. Seriously, the entire process was easier than installing and patching many commercial MMOs. It took about half an hour including all the downloads. Other than some fiddling with screen resolutions when I logged in the entire process was just about automatic. Whose sweat? Not Lucan's, that;s for sure. My second attempt was a human Paladin following Mithaniel Marr. There was a brief FFS! 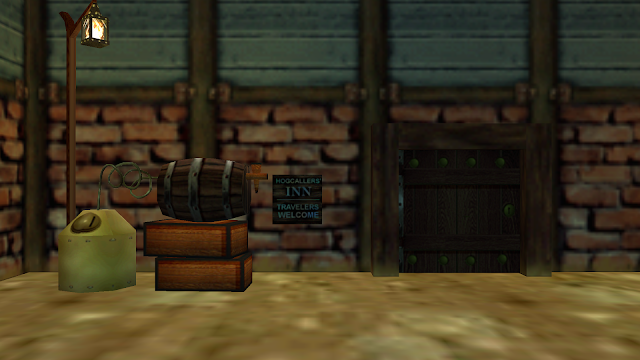 moment when "You are entering The Mines of Gloomingdeep" flashed across the screen but when loading completed (very much more quickly than it ever did back in the actual 2002) there I was outside the Cleric Guild - in Freeport! What followed was both a huge nostalgia trip, an emotional welcome home and a reminder of just how very, very unforgiving EverQuest can be for a newcomer. Starting out in Freeport there's a total absence of any suggestions on what to do or where to go. If this is a theme park it's one with all the rides powered down. No wonder they created Gloomingdeep. It's not only that all - and I mean all - of the expected lifelines are entirely absent - no feathered quest-givers, no sparkly trails, no encouraging voice-overs... It's not even that the designers seem content just abandoning you to your own resources. It does sometimes appear they've set out, willfully, to confound and confuse you. Why, for example, does a new Paladin appear outside the Temple of Marr? The one and only starter quest that Paladin gets requires she present herself to her guild leader - who isn't in the Temple of Marr. He is, unsurprisingly yet now obscurely, in the Halls of Truth, an entirely separate building, across the river. As a new Paladin you have no idea of any of this until and unless you decide to open your inventory. Assuming you know how to do that. When you do, you'll find a very bad sword, some food and drink and a candle because back in 1999, although not in 2002, it really did get that dark in Norrath. There's also something that looks like a small, beige washcloth, which is in fact a note introducing you to your Guild Leader. That's your NPC guild leader, not a player, who might actually care enough to explain this stuff to you. At this point, far from having a guild or friends or possibly any fun, you need to intuit that a) this washcloth is some kind of a note and b) that you read a note by right-clicking it with your mouse. Good luck with that. If you're paying attention this is the point you realize you aren't where you need to be. You need to explore the city to find the building you want, then explore that building to find the NPC who, it seems, holds your future in his hands. Once found, you have to somehow conceive that the way to "give" him the note is to left-click it so it sticks to your mouse pointer then drag it onto his body and let it go. Well I've done all this a hundred times so of course I just sailed through it. Not. I did remember you need to speak to your guild leader but I forgot all about the note so I barged straight through the first door I saw - the one I spawned right next to - and spent ten minutes (literally) running up and down the stairs of the wrong guild house fruitlessly "hailing" everyone I saw. I won't even go into how you're supposed to know how to "hail"an NPC. Or what "hailing" is. Eventually it came back to me about the note. I opened my pack, found, clicked and read it. I'd love to say I struck my forehead and said "D'oh!" and ran straight to the Paladin guild but what I actually did was run straight back into Temple of Marr yet again - still not noticing it was the Cleric Guild - for another, equally fruitless, round of stair-climbing and hailing. So, to cut a long and increasingly frustrating story short, I did finally read the note again, more carefully. Taking in what it said, at last, I went looking for the Halls of Truth, which turned out to be pretty much across the street and round the corner. Even once I was in the right building it took me another five minutes to find the right NPC because of course he's not in the main hall or near the entrance or anywhere remotely obvious that you might expect to find your first responder quest guy. No, he's out on a terrace at the back of the guild, moodily staring at a pond. I got my shirt, which is what your Guild Leader gives you on your first day in Norrath, indeed all he gives you, and put it on. Along the way I'd somehow acquired another note from some Knight or other which he wanted me to take to someone at his home in The Commonlands. Seriously, that's all the direction I had. That's like giving someone a letter to deliver and addressing it "Jim, Jim's House, Nebraska". Mention of The Commonlands did remind me of another very odd design decision taken by the original EQ team. The Paladin and Cleric guilds are both in North Freeport but there is nothing a level 1 Paladin either can or indeed should kill in the entire zone. The nearest practical place to begin using that really crappy sword is the brief strip of desert outside the gates of either East or West Freeport. Nothing tells you this and in a game based almost entirely on killing things that seems like an oversight. Now this guy lives where, exactly? Oh never mind, how dangerous can it be? If there's ever been an MMO where the question "where do I go to level up?" represents a genuine cry for help rather an indication of severe lack of imagination, EverQuest is that game. You could so easily spend that famous first thirty minutes in which new players decide they've made a terrible mistake and wonder what the refund policy is, just running around North Freeport (or North Qeynos for that matter). You'd never see one rat let alone kill ten. Which no-one is asking you to do anyway. If only! Goes without saying I had a wonderful time. I visited all the old haunts - the Theater, the gallows, the marketplace, the bank... I took screenshot after screenshot and just rolled in that good old Freeport dust, at least until the thunder started and the badly-animated rain came down in lines. I killed a decaying skeleton for his rusty halberd, so slow but so much more satisfying than my stupid rubber sword. Then I killed an orc pawn to see if he had any armor, which he did, only it was the wrong size. I'd forgotten armor comes in both different materials (cloth, chain, leather, plate) and sizes (small, medium, large). It took me an hour to get to Level 2 although a lot of that was exploring. It was still a lot faster than it would have been back in the day. Project 2002 has a 20% xp bonus for a start. It's not the genuine 2002-2004 experience because, guess what? Time travel doesn't exist! All the same, P2002 might be the closest you're going to get to that lost past and it looks like the easiest way to get there, too. Nevertheless, I won't be settling down and leveling up there. I'll keep paying my All Access sub to DBG and when I want my EQ fix I'll find it on the official servers, most likely trying to edge my Magician closer to three figures. Still, I'm very glad someone's taking the trouble to preserve at least one version of the "Golden Age" and I'm also glad I took the trouble to open that door to the "past", at last. Even if you can't really go back in time, you can go back to the real Freeport. I recommend it. 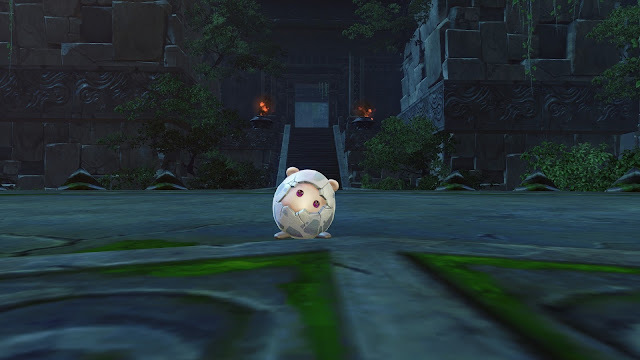 So, I poked around some more in Revelation Online this morning and I'm more confused than ever. A lot more. To the point where I'm starting to wonder if maybe something closer to a formal tutorial might not be a bad idea after all. My plan was to try and find out something about crafting and gathering. I noticed one or two nodes while I was auto-running from quest to quest and something at some stage had prompted me to open the crafting window so I knew they both existed but that was the extent of my knowledge. An hour later it's still the extent of my knowledge. I managed to find a vendor who sold gathering and crafting tools but they all required a level of skill I didn't have. What I couldn't track down was a trainer or a quest that might offer me the opportunity to pick a craft and raise that skill. Now, of course, I could have just tabbed out to Dulfy, who has, naturally, a detailed walk-through up already. When we hit Open Beta, assuming I decide to join in, that's exactly what I'll do. Or I could have used the extensive in-game guide...if I could read Mandarin (I'm guessing it's Mandarin...). Or I could click on the little helper icon that auto-tabs to the official website. Any of those. For now, though, and since this is a Beta Test after all, I thought it might be instructive to try and figure out what was going on just from first principles. After all, how hard could it be? Too hard for me, that's how hard. First attempt lasted around an hour. I rode my horse around the coastal town where I'd camped for the night in the vague hope there might be a trainer there. 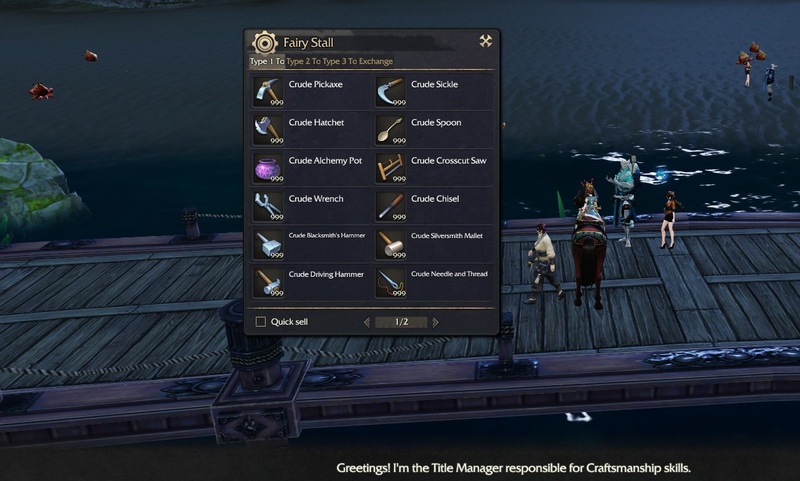 There was a "Title Manager", who claimed to be responsible for craft skills and sold the tools but she wouldn't talk to me, so I opened the map and clicked on an icon in the nearest large town. Couldn't find a trainer there, either, but I found the tool vendor again along with a host of other merchants and functionaries. There was also one of those player marketplaces familiar from much older Eastern MMOs, where everyone drops a personal NPC trader in a public square and clutters up the environment. Never liked those. By this stage I was beginning to feel a little overwhelmed. I mouseovered all the icons along the bottom of the screen to see if one might be the crafting window, only to find that every one of them popped up a context menu with three-to-five more options. At this point I panicked and found myself clicking on the auto-complete for my main questline. Boom! Back on the story train! A dizzying twenty minutes of clicking, autorunning, cut scenes, very brief scuffles and a truly incredible amount of utterly confusing backstory later and I was back where I started only five levels higher. Time to get a grip. It's all gone sepia - must be a flashback. My next bright idea was to open the map and mouse over the icons there. I was hoping to find craft trainers marked but I was out of luck. 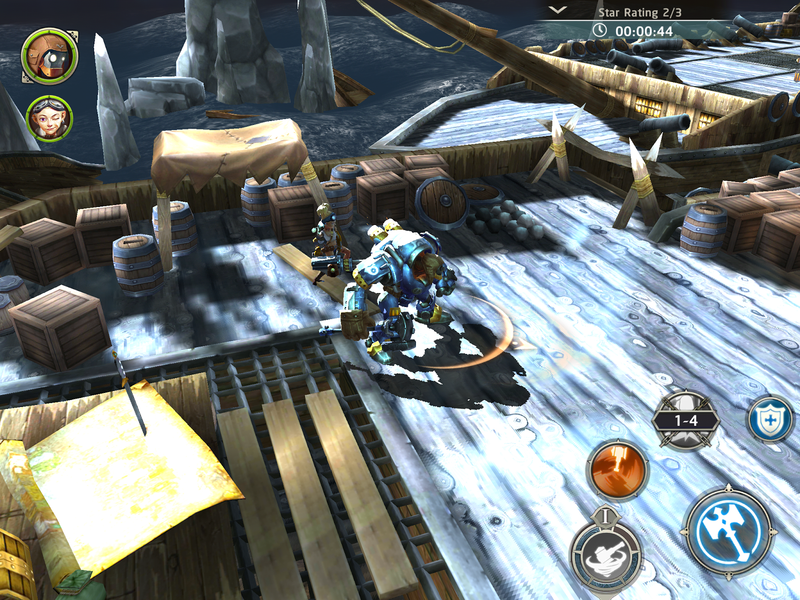 I did, however, spot the Inventory NPC. 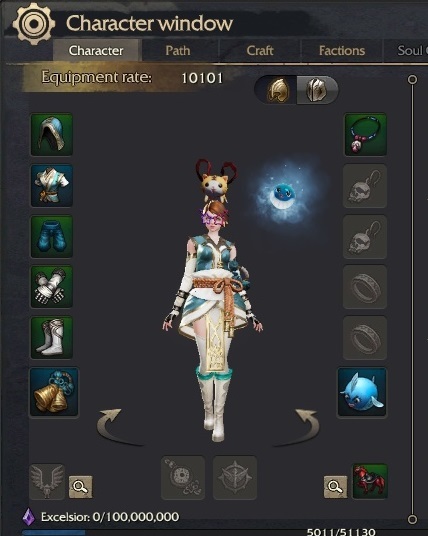 Revelation Online starts you out with a decent sized inventory and I'd already received three small extension backpacks for it from questing - two four slots and an eight slot. Only the first expansion slot was freely available, though. The tooltips on the bags (everything in RO is extensively and helpfully tooltipped) suggested I needed some crafting mats to make the bags useable, which I could either buy or quest for at the Inventory Attendant - or "Banker" as we'd usually call her. Are you saying I'm Johnny No Mates? It's a somewhat convoluted way to increase your storage space but at least I could find the relevant NPC, I had the relevant bags and currency and she was willing to give me the quest. Which turned out to be "kill five deer". Why? You tell me. She certainly wasn't going to. Autorun out of town, button mash five deer down, autorun back. One more bag slotted but I still had one left. So I asked her for another quest and she told me to make a friend. Come again? It's a thing I've noticed in Eastern MMOs. There's usually a point where you have to make friends with a random stranger just to get some quest over with. Well, someone was standing there, minding his own business using the bank right next to me, so I clicked on him and friended him and he accepted and that was that done. Never spoke. I knew we wouldn't. It completed the quest but it didn't get me the mats I needed to make the bag. I should have looked at the reward before I wasted a good friending. Never mind, I went off exploring the town, the name of which I forget but which is quite large, and somewhere among the scores of merchants, trainers, faction vendors and questgivers I ran across one who sold what I needed. Pardon me? Is this the pink broccoli forest? I'd about run out of steam at that point so I went and had lunch, went for a walk, got my hair cut. When I got back I gave looking for a crafting trainer another go. I didn't find one. 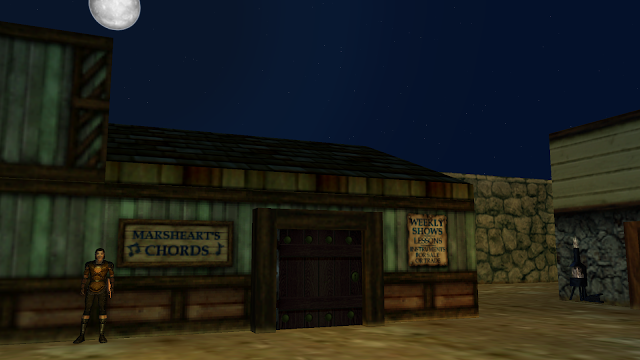 I did find a wild west town surrounded by giant mushrooms and populated by fox-racoons. I saw large and small bears operating heavy machinery, sometimes with their noses. I came across a Hot Springs spa resort staffed by fairies and goosestepping underwear models. I went on a long and wonderful night ride under the most spectacular sea of stars. And I took over seventy screenshots. I still have no idea how to begin gathering or crafting. I don't know how to get a house, moving or stationary. I blanch just looking at my multiple skill tree windows. I'm also beginning to get the idea, having been turned away by NPC after NPC for not being Level 49, that maybe the entire game up to that level is the Tutorial. It probably needs to be. The default option here is very much to sit back, left click and watch it all roll by, which makes the whole game seem ludicrously simple. The moment you stop and try to figure where you are and what to do next you realize it is, in fact, ludicrously complicated. 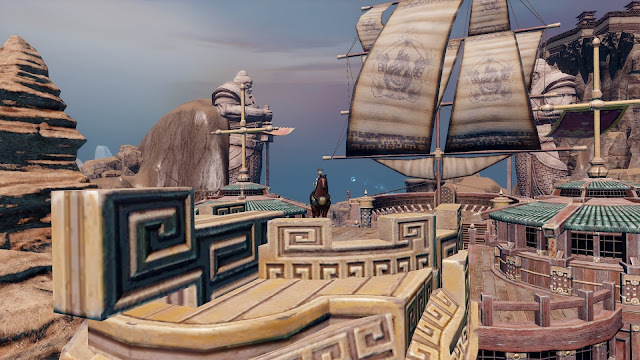 Revelation Online offers a hyperinflated version of what we saw a year ago in Black Desert. 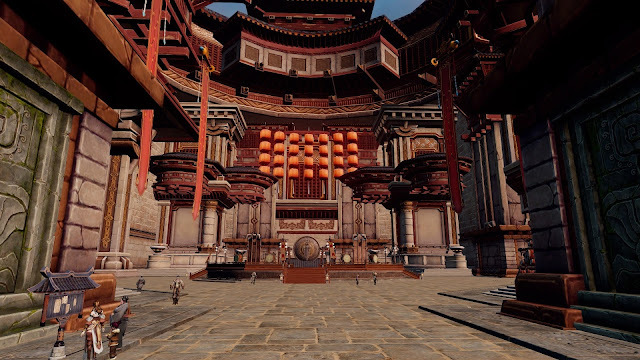 It appears to have at least as many subsystems and mini-games, albeit nothing quite as unfamiliar as those which so confused BDO neophytes for the first few weeks. Both games have a number of odd, idiosyncratic systems and mechanics, all of which you probably will need to learn in detail eventually if you ever want to have any chance of holding your own in what are, in the end, MMOs predicated on player vs player competition. In Black Desert, you can (and many players do) postpone learning about any of them by choosing to follow the queasy promptings of the strange, demonic figure that joins you at the very start of the game. I never felt comfortable doing that, largely because of the openly weird suggestions made by the sentient, sibilant inkblot, which was probably the designer's intention. I hope those are stars not nuclear fallout. In RO, however, that unsettling doubt is replaced by a pat-on-the-head, doing the right thing feeling that glows warmly inside you as you obediently follow a never-ending series of neutral on-screen prompts. Doing so provides an equally endless dripfeed of dopamine hits as LEVEL UP! 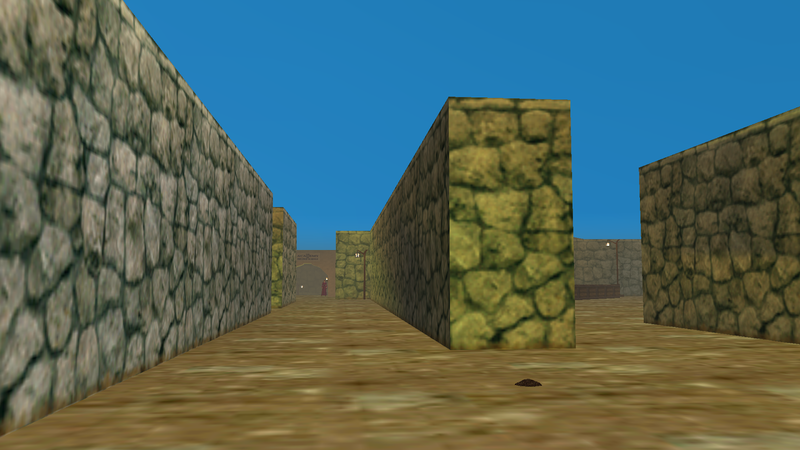 flashes across the screen over and over, which makes it a much harder path to step off. Nevertheless, step off you must, if you're going to have any clue what you are doing. 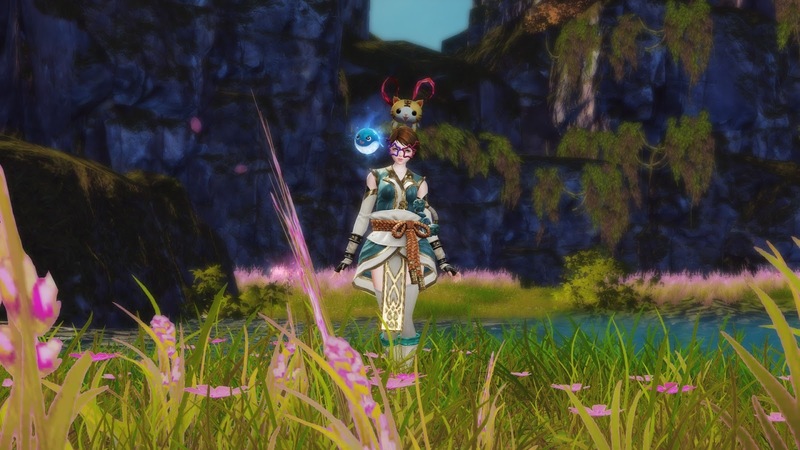 Blade and Soul, the third in this triptych of Eastern imports, also has a number of arcane and counter-intuitive mechanics but takes an entirely different approach. Absolutely everything there is presented in painstaking, sometimes excruciating detail. 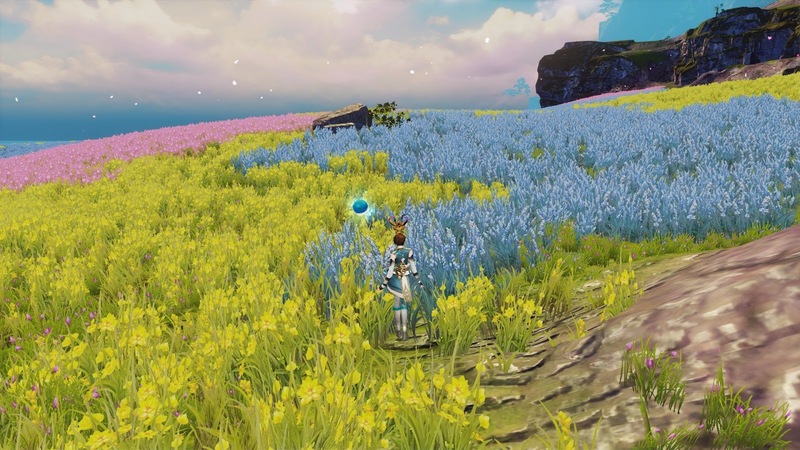 Quest after quest after quest bangs home the precise process of every system until you feel more as though you're revising for an exam than playing a video game. Speak for yourself. I liked fox-racoon town better. Of the three styles I think Black Desert comes out very much the winner. You get to learn just enough before you become overly suspicious of the black demon. Then you want to learn more but at your own pace. At which point it's off to the wiki for some serious research. 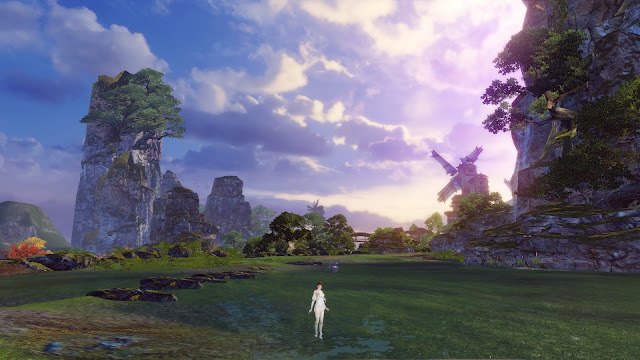 I get the impression that the people behind BDO knew they were doing something at least somewhat original, whereas the developers of Revelation Online are, probably rightly, confident their core audience has already played many MMOs that work much the same way. 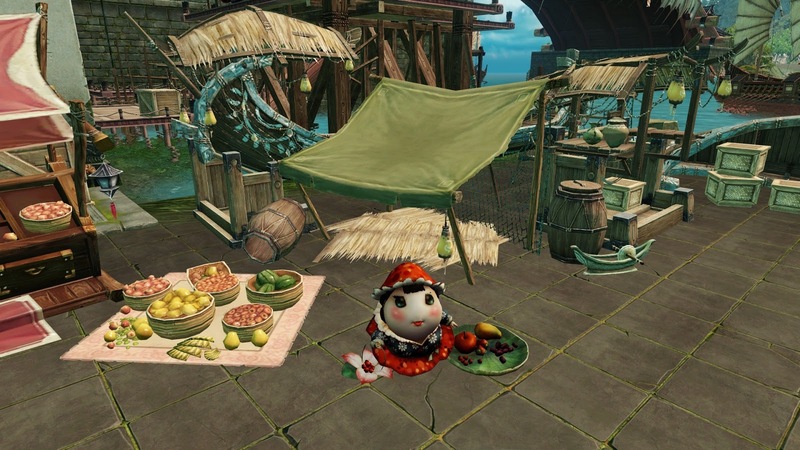 (Blade and Soul, on the other hand, is a game by and for control freaks). 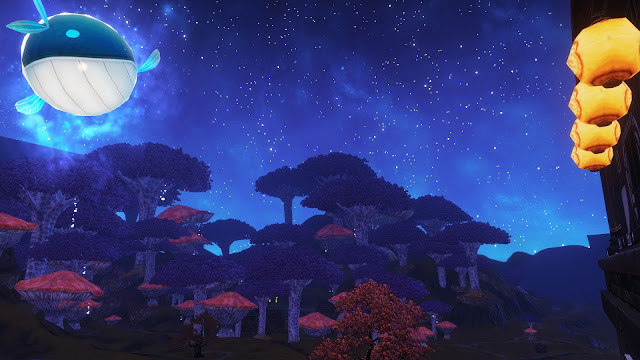 What all these MMOs have in common, I think, is an expectation that players will commit. Commit time, effort and energy. They have big, over-complicated mechanics and lots of them and most likely for a reason, that reason being money. I get the impression that life gets a deal less complicated if you don't mind opening your wallet at the cash store. Is that a fish I see before me? If you want do it on the cheap you need to be ready to put in the time, not just grinding but reading and learning. If that's something you enjoy then it could be a very good deal indeed. Or you could just click through the story and watch the scenery go by. It's very pretty scenery. Something no-one seems to mention about MMO blogging is the way it affects both your perception and your choices as you play. There's always a script running the background, prompting you to screenshot this or make a note of that, all with a view to posting about it later. The upside is that every MMO, even the most generic, uninspiring knock-off becomes more interesting and rewarding than it has any right to be. The downside is that you rarely get to experience the pure, unadulterated immersive feeling of being lost in another reality. When that does happen, when you forget about recording and reframing what you see and hear, when you lose yourself entirely in the moment and let the ocean of new possibilities sweep you up and away, that's when you know you've found something true, something that will last. I think the last time that happened to me was in the beta weekends for GW2. In Revelation Online Closed Beta 3... not so much. Which is not to say I didn't have a good time playing RO for several hours yesterday, or that I wasn't fully involved, intrigued, occupied and amused. All of those things but most of them as a blogger not a player. Without any exaggeration I could get a week's worth of posts out of just those first two sessions - long, detailed posts, too. Every minute I was playing ideas were sparking off the screen - the similarities, the differences, the little twists and wriggles in the form. Almost nothing failed to remind me of something else. The entire game might as well exist as a primer for discussion of the genre. RO has one of those immensely detailed character creators with sliders for everything from the size of your hands to the slope of your eyebrows. Unfortunately I couldn't find any way to zoom in on my character's face so all that detailing was completely wasted. I picked the stuff I could actually see - height, build, hairstyle - and left the rest at default. The other problem, about which nothing will ever be done, is the utter blandness of the "races" you can choose. You can be a human or a child-like human and that's that. Unlike Western MMO players, a significant subset of whom like to play non-human and even - *gasp* - ugly races, the Eastern market apparently demands humans, humans and more humans. RO doesn't even the usual option of "human with cute animal tail and/or fur" or "human with pointy elf ears". The game does a bit better when it comes to Classes. There are six - Blademaster, Vanguard, Swordmage, Occultist, Spiritshaper and Gunslinger. There's a decent explanation of what you might expect from each in terms of gameplay and there's also a difficulty rating. I went with The Spiritshaper (Difficulty Rating 3* out of five, equal easiest with Gunslinger). It had possibly the most confusing description, which I think I may have misunderstood. I was expecting a pet class but although there is a tiny, floating creature that hangs around near your shoulder, that turns out be your "weapon" rather than a traditional pet that tanks for you. This is where I give RO a huge thumbs up. The UI is easy to follow and to alter and adjust. Yes, it's busy, with too many pop-ups, but I've seen a lot worse. Most impressively, the developers have chosen to do what I believe all developers should, namely offer a wide choice of controls to suit a wide range of tastes. As a traditional MMO player I strongly - very strongly - prefer traditional MMO controls. I like WASD movement, Hotbars and tab targeting. 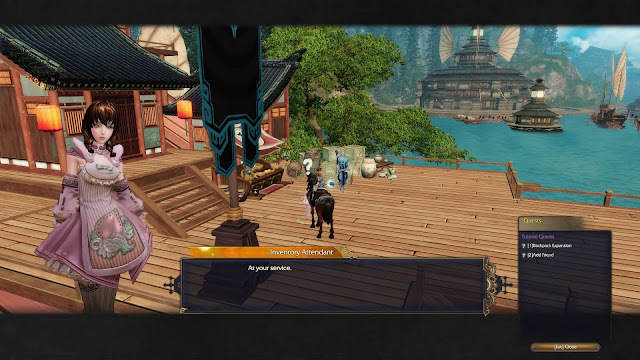 As soon as you step out of character creation you're offered a choice - the system I prefer, the traditional Eastern "click to move" or the action MMO option with reticule targeting. I didn't try the latter options so I can't vouch for their implementation but the regular version, called "Keyboard Control" in the game, works perfectly. This is a hard one. Having played a number of Eastern MMOs over the last few years there's a particular graphic quality I've come to recognize. I don't mean the settings or the environments or the architecture (although all of the usual cliffs, waterfalls, pagodas and flower fields are present as expected) so much as the textures and surfaces. There's that odd flattening and stretching you never seem to see in Western MMOs, where surfaces close by seem to be almost featureless but scenery far away looks lush and detailed. As usual, screenshots of the game look very much more impressive than the same views seen from within the game itself. I found it somewhat jarring. Before you arrive in the game world itself there's a really impressive intro in gorgeous pastel washes and that style continues for the inter-zone screens. If only the whole game looked like that. Most of the cut scenes use gameplay graphics but there are also some very unsettling variations which seem to use treated live action footage or something that at least suggests a form of realism that feels quite alien to the game you've been playing. All in all a bit of a hotch-potch but generally pretty enough to make a favorable impression. Where to start? Is there any? Perhaps it's a bit early to judge. After about three hours or so I hit level 21 but I'm not sure I've actually "played" the game yet. I've watched a lot of it being played by my character but I don't feel I had an awful lot to do with anything that happened. I've played "on rails" Korean MMOs before but RO is on another level entirely. There is a single throughline Main Quest sequence that grabs you by the hand at level 1 and doesn't let you take a breath until you ding 20. The game gets a huge plus from me for having no tutorial whatsoever - from the moment you begin you're in the full gameworld and every tip and explanation is integrated into the questline. On the other hand it never stops! I can't remember ever playing an MMO that felt so unrelenting, breathless, urgent, even when all I was doing was serving pies or raising a flag. A lot of that was my fault. RO has the ever-popular Eastern option where you can click on a UI feature and have your character run to the next quest junction. It also pops up a clickable icon in the center of the screen whenever you need to speak with anyone or interact with anything. All of these automated systems work flawlessly, which means that you can play almost the entire game with nothing but the left mouse button. So I did. The first twenty levels of Revelation Online features perhaps the least active combat I have ever seen in a mainstream MMO. There were long stretches, during which I leveled up several times, when I didn't have to fight anything at all. When I did it was mostly so the game could explain some mechanic or other - dodging, combos, special attacks - none of which was ever remotely necessary to defeat the incredibly weak opponents I was facing. Eventually there were a few "proper" fights, including an all-combat instanced dungeon that the game confusingly insisted on calling a "Raid". At first I tried to follow the instructions, build my combos, dodge the red squares and circles, all the usual rigmarole. Then I realized I could just as easily stand still and drum my fingers on keys one to three and not just have the same effect but actually kill things faster! There were a couple of "bosses" that I did dodge, although whether I needed to or not is another matter. I died once in twenty levels purely because I had misunderstood an instruction. A couple of times the game auto-defeated me so an NPC could leap in to save the day and move the plot forward but other than that nothing slowed me down or threatened me at all. All of which means that at level 20 I have no more idea how to play my character than I did at the start. Leveling does change pace at 20 and there is now more combat but so far the fights aren't any harder. Presumably there comes a point when you do need to know what all the buttons do but I'm not there yet. Another very big mark in RO's favor, from my perspective at least, is the relatively traditional approach it takes to weapons and armor. I'm almost certain there are some complex upgrading options I haven't been introduced to yet (Dulfy will tell you all about those) but so far it's been a straightforward case of get item, equip item, see item show up on your character. The paper doll also has a regular number of gear slots - head, chest, hands, legs, feet, various jewellery - familiar from umpteen other MMOs. As for basic stats, there are only five, all with recognizable names and understandable explanations. I felt instinctively that I knew where I was with RO, which is something I never really felt with Blade and Soul or Black Desert, where appearance, stats and items all seemed to drift independently around each other in a rather awkward and unsatisfying gavotte. There are also Appearance slots that seem to work just like the ones in EQ2. That's how come my character is wearing a cat on her head and comedy spectacles in the screenshot above. Trust me, those weren't even the silliest choices. I was very pleased to get them as quest rewards. That sort of stuff is too often kept for the cash shop. Why shouldn't tightwads look every bit as gormless as spendtrhifts? As for progression there seem to be a lot of skill systems to work on. There are multiple UI windows with lots of tabs and skill trees, not a one of which I even begin to understand yet. From experience it generally takes me weeks of play to get the hang of things like that so they stand outside the scope of a first impressions piece. Leveling speed is also hard to judge at this stage. I dinged Level 2 just from walking from spawn to the first NPC and it doesn't really slow down all that much for the first twenty levels. It's very fast indeed - much, much faster than any other triple-A import I've tried, including Blade and Soul. On the other hand, you could, and probably should, look at those twenty levels as an extended tutorial. There was a very noticeable step-change when I dinged 20 so I'm guessing it slows down a lot. Still fast compared to the traditional Western leveling pace though, I'd bet. 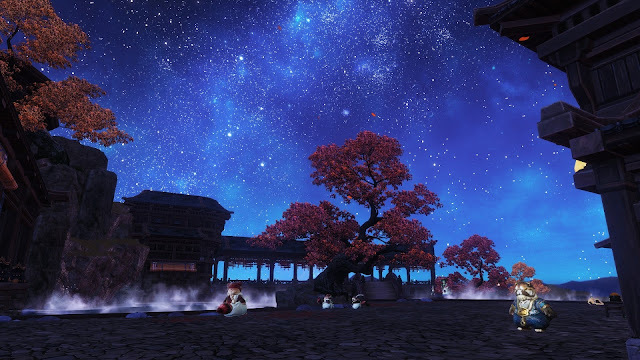 RO has been compared to Blade and Soul and having played it for a while it's very easy to see why. It looks quite a lot like it and the storyline is not dissimilar but the real clincher is the movement. There's all that jumping and rushing and gliding busywork that I got to be quite comfortable with in B&S, only here it seems perfunctory, bolted on. I'm guessing that's because, unlike Blade and Soul, RO is an MMO that offers full, free flight (albeit with a stamina mechanic called, amusingly, "Levity"). You get to see yourself in wings in Character Creation and there's a point in the narrative when an NPC lends you his so you can have a bit of a fly about. It feels pretty good, too, although somewhat fiddly in places. At twenty-one my character still doesn't have a pair of wings to call her own, though, so how it feels to fly as a primary action I'm yet to discover. 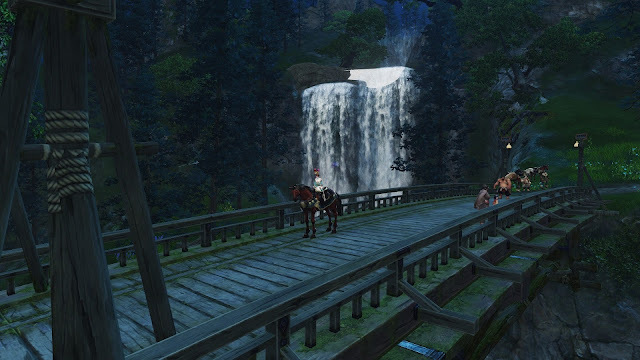 At one point I acquired a horse, which increases ground speed as you'd expect, but once equipped my character seemed completely capable of deciding when to mount or dismount without my intervention so it became more of a visual representation of a speed buff than something I thought of as My Mount. Mostly, though, I just plodded along at normal speed because once you give yourself up to the auto-run function that's what it does. Boosting run speed or leaping about just tended to disrupt the flow so I didn't bother. Storytelling is supposedly quest-driven but the "quests" are really little more than a means of getting you from one cut-scene to the next. I swear I have never watched so many cut scenes, read so much dialog and absorbed so many minor, pointless, trivial stories in such a concentrated timeframe in any MMO I have ever played. In RO the story literally never stops. On and on and on and on and on like the world's most relentless teen drama, all sibling rivalry, mysterious threats, unexpected reversals, hidden secrets...like every single other Korean MMO I have ever played, only on amphetamines. The quality of the story and of the set pieces varies wildly. The scene where the main NPC and (probably) love interest makes his entrance is staggeringly overdone. He literally drops from the sky to a blaring pop-metal soundtrack that's insanely inappropriate and out of context, ending up with his face pressed flat on the floor and his body jacknifed in a supposedly comic pose that just looks ridiculous. On the other hand, the whole strand featuring your character's short-tempered, somewhat arrogant friend and her diffident boyfriend has a nuance and gravitas I wasn't expecting. I found the cut scene with her on the cliff top surprisingly emotionally affecting, to the point where I won't describe that part of the plot in any detail in case it might spoil things for someone else. One innovation I can't recall seeing elsewhere is a specific reward for watching cut scenes. If you make it to the end without clicking out you receive "Storyteller Favor" for being a good listener. I got a lot of points for that. No idea what they are for but I like the idea. In common with most, although not all, Eastern conversions the quality of the translations is, to put it politely, variable. I've noticed that quite a few imports begin with solid translations that then quicly diffuse and warp as the levels rise and that's exactly what happens here. By the time I'd left the starting village some of the NPCs were barely making sense. Even at its best this is not one of those genuinely quirky, odd, amusing translations like Digimon Hunter or (according to Syp) Twin Saga. It's mostly bland although it does have the odd spark. As for the audio, there seems to have been little or no revoicing as yet. There isn't all that much speech but everything there is comes in Korean. More awkwardly so do some of the in-game help screens. That'll have to be fixed. Lengthy though this post is it barely scratches the surface of all the things I might have considered or talked about. 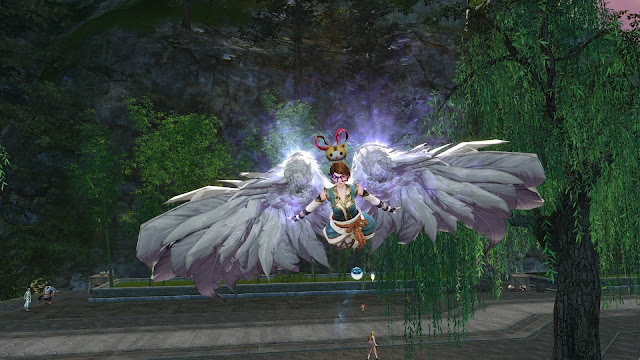 I found RO fascinating in the way it both closely resembles and significantly diverges from other MMOs I've played. I also feel that although I have a level 21 character currently camped out several zones on from the starting area, I know about as much about the game as I'd normally know by level five without leaving the starter village. I need to make another character and play through at my pace rather than the hyperactive pace the game dictates if you allow it. I need to go off rails and play the explorer card. I know you can because, briefly, right at the start, I ran out of the village, climbed a cliff and dived into the sea, ending up somewhere seemingly impossible to reach. I couldn't get back other than by hitting the "I'm Stuck" button so the game definitely permits more freedom of action and movement than I've chosen to take advantage of so far. There are also crafting, gathering and housing options that I haven't even found yet, along with some kind of (mandatory?) PvP. Which reminds me...this is an MMO, right? Because so far my experience is almost 100% that of playing a single-player RPG. If you're on the main questline, which I almost always was, the game hides all other players by default. I've barely seen anyone! 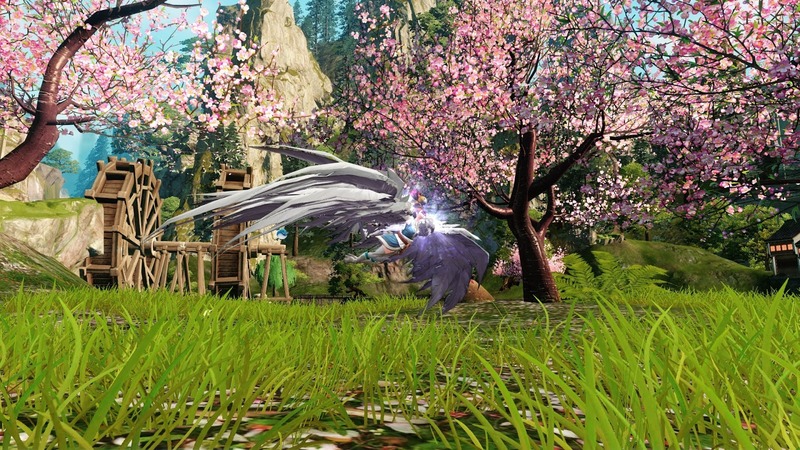 I can say with some certainty that Revelation Online is not going be my Next Big MMO. I doubt it will for anyone reading this, unlike Black Desert or even ArcheAge, both of which made a fair fist of drawing people in and holding them for months rather than hours. There is, however, plenty going on that deserves closer attention. It's not a once-and-done flyby either. I'll probably keep my powder dry for Open Beta if only because progression is likely to be very linear and I doubt it will hold my attention for more than a couple of pass-throughs so I'd prefer to wait for a character that isn't going to be wiped. It's a step up from Riders of Icarus, on a par with Blade and Soul, and definitely worth a look if you like this sort of thing. If you don't like this sort of thing though I wouldn't bother. It's not going to change your mind.